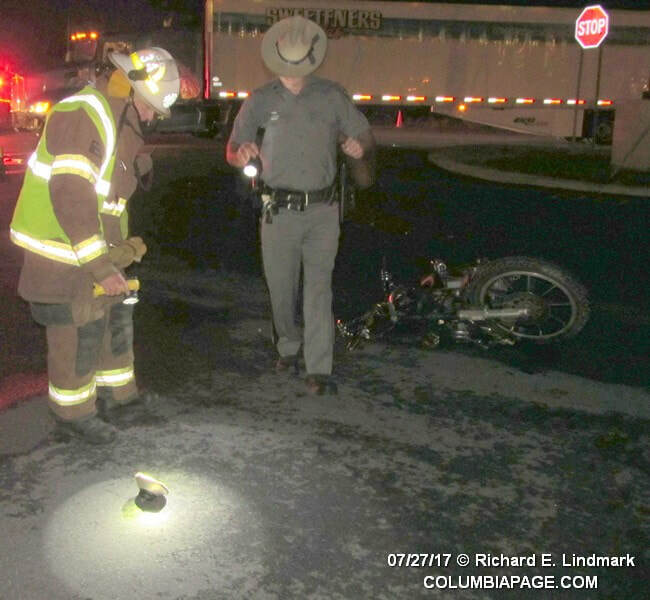 Canaan, New York – On July 27, 2017 at approximately 8:31 p.m., New York State Police from New Lebanon were dispatched by Columbia County 911 to a motorcycle vs. tractor trailer collision on State Route 22. An investigation revealed that 36-year-old Mark A. Shaw of Canaan, NY, was operating a 1983 Harley Davidson motorcycle southbound on Route 22. A 2011 Kenworth truck and trailer, operated by 46-year-old Wayne E. Quick, of Rochester, NY, was making a left hand turn into the Loves Travel Plaza from Route 22 northbound. The truck’s operator failed to yield to the right of way of the motorcycle and the two subsequently collided. The motorcyclist was pronounced deceased at the scene. The crash was reconstructed by the State Police Collision Reconstruction Unit. Also at the scene were members of the State Police Commercial Vehicle Enforcement Unit, SP Livingston Bureau of Criminal Investigation, Canaan Fire Department and the Chatham Rescue Squad. At this time, the collision remains under investigation and no tickets have been issued. ​Red Rock VFC was also on the scene under mutual aid.